I don’t know why speculative fiction seems to never get its due respect amongst literary genres. Unless it’s Atwood or Stephen King, though I think even King is relegated to the not-so-serious pile more often than he should be. Which is ever by the way in case you were wondering. What I find the most impressive about speculative fiction is, done well, the seamless creation of fantastic realities that make sense. The book doesn’t even necessarily have to be all that great for the affect to be achieved. And, well, Autonomous is one. The book is okay. The story follows Jack, a pharmaceutical pirate, who is being hunted by Elias and his military robot Paladin. Newitz creates a world that is vivid and interesting, and explores AI morality, gender, sexuality, pharmaceutical and patent ethics but when it’s all smashed together it’s just okay. Okay is better than most, but it’s still okay. On Wednesday I decided that on Friday I would ease into the Labour Day long weekend by running home from the office. I’ve wanted to do this run for some time but never got around to it last marathon training cycle for the stupid reason that my marathon training schedule called for my long run on Sunday and definitely not on Friday. Friday was to be rest day. And while that was my first marathon and was probably not the time to be fiddling around with training schedule on the freshman attempt, I ignored one of the most important rules of just about any sort of plan, which is to write your plan with a pencil. So I ran home on Friday, and it sucked. About 15 KM into what turned out to be a 35.5 KM run my body said okay that’s enough let’s just read a book for a bit now. So for the next 20 KM it was pure willpower. 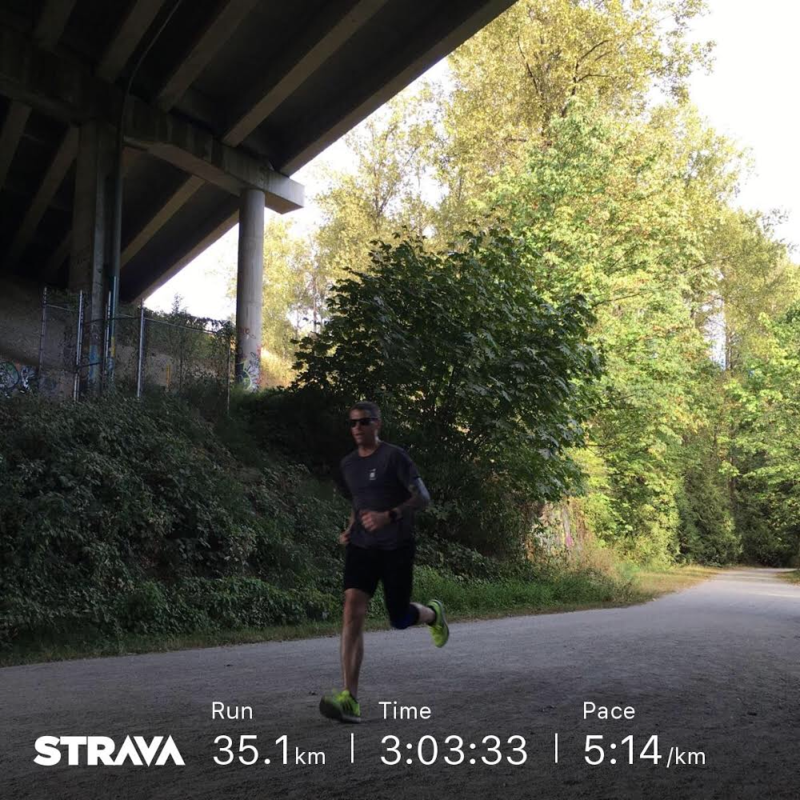 Which was a great test and I feel like I passed but I also have growing concerns about my knees cooperating come the Victoria Marathon on October 7, and my body not deciding that just over a third to the way through it is time to check out. And maybe probably possible that’s a good thing. With five weeks to go there’s still time for a little under-confidence motivation. Friday sucked. I’ll probably do it again.